So… you’ve got no shortage of talent in the horse power department, but maybe you’ve struggled to channel it in a positive direction to get the WINS you have in mind. OR perhaps things are going well, but after resonating with the content I share, you’d love the opportunity to work (and ride) together to up your game. Maybe you have a very specific problem like tipped barrels, an issue at the gate, or you’re just NOT clocking. I get it. It happens, and it’s insanely frustrating. You CAN develop educated, confident, high-achieving equine athletes, AND make your barrel racing dreams REALITY. I’m now offering another option to help you do that. Other than my best selling book series, below I’ve shared how I currently connect with dedicated barrel racers like yourself. Recently I opened the doors to a few, very limited opportunities to work with me one-on-one in the form of video coaching to take YOUR runs to a whole new level. 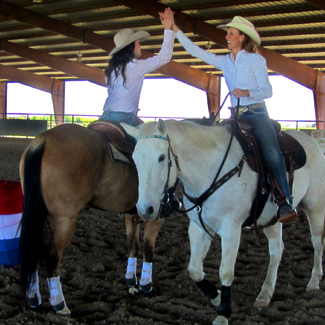 Advancing your horsemanship and barrel racing doesn’t have to be limited by location – Video Coaching is the perfect option regardless of your geographic location (or mine, which changes a lot). Whether you’re a barrel racing newbie or a seasoned pro, there couldn’t be a better time to ensure that when YOU blast through the gates this season that it’s with complete confidence, so that your results will not only bring a smile to your face, but winnings to your pocket. Let me save you time, spare you frustration and help you receive just as much enjoyment and satisfaction in return for ALL you’ve invested into your barrel racing program! This is your chance to rent my eyes & brain for an hour at a time and reap the rewards forever! Here’s how it works: First, you’ll choose a date and time from a selection of available spots on my Calendly calendar. Next, you’ll make an easy online payment to book your POWER HOUR or the start of your three-month FRIENDTORSHIP, and will automatically be sent a short questionnaire to fill me in on what you’re needing guidance with most. You’ll return the completed questionnaire (where you’re welcome to include a link to a YouTube video up to 10 minutes long) within 24 hours before our scheduled time, so I can carefully review your deets and do some brainstorming. Then, at the specified date and time you’ll give me a jingle on the phone and I’ll help you strategize and develop an action plan to get on track toward the WINS we both know you’re quite capable of! You’ll take action, tweak & tune, and be amazed by the results! Did I mention it’ll be a whole lotta FUN? If this sounds like a dreamy way to get a huge step closer to achieving your barrel racing goals, then click here for more details. I look forward to getting YOUR Video Coaching session on the books! Nothing compares to the blast we’d have in person and on horseback as we break things down to move on up in a horsemanship + barrel racing clinic. *Although I’m not booking clinics or private lessons at this time, please click here to subscribe for FUTURE clinic news, updates and details via email. This has been on my heart & mind for quite some time and is in the works.